Personnel - Michael Attias: alto saxophone; Sean Conly: acoustic bass; Satoshi Takeishi: drums. 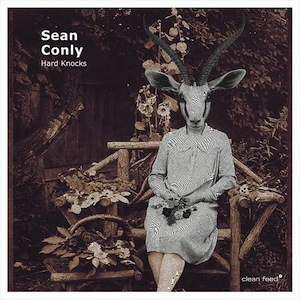 Sean Conly had his first electric bass at the age of 13. At that time, he couldn’t imagine he would become a respected bandleader and sought-after sideman, establishing unfading foundations in groups led by Anthony Coleman, Greg Tardy, Michael Attias, Yoni Kretzmer and Mara Rosenbloom. With Hard Knocks, his second work for the progressive Clean Feed label, he plunges into a set of six modern jazz compositions penned for his powerhouse, chord-less trio composed of longtime comrades Michael Attias and Satoshi Takeishi, alto saxophonist and drummer, respectively. Expanding their actions beyond tradition, the trio sets that special, interactive mood that is only possible when the rapport among the involved is strong enough. The title track unfolds with a variety of rhythmic accents (knocks, if you prefer) and a fine groove. It’s a well-crafted, well-structured, metrically astute piece that takes us to Sam Rivers’ spins. Exploration is undertaken individually when Attias extemporizes thoughts over a profuse swinging vibe locked by bass and drums. After him, it’s Conly who carefully groups selected notes to form consistently bright phrases. Gradually built in layers, “Totem” kicks off with the attractive timbres of Takeishi’s percussion. We don’t have to wait too long for the saxophonist to join with a sinuous Eastern-influenced phrase carrying an occasional vibrato. Lastly, the bassist sneaks in to lead his gang toward an energetic rock-tinged flux in six. “Skippin’ Town” is immersed in those avant-garde waters once agitated by Dewey Redman and Ornette Coleman. It features not only an enthusiastic swinging section underpinning the sax solo, but also a reiterative odd-metered bass groove on top of which Takeishi creates with freedom. The trio’s keen sense of tempo is obvious on “Loose Screws”, a blues-based piece crafted with high melodic articulation and shifting rhythms, whereas on “Artefact” they probe textural definition and intensity of playing. The band starts by forming a dense, stormy sonic cloud that thunders with fierce saxophone growls and multiphonics before being pacified by disruptive drum chops, a leisurely steady bass motion, and gentle sax melodies infusing a mix of light and dark tonalities. Devised as a sort of meditation, “Undertow” is introduced by the bandleader with tranquil assurance and lapidary clarity. After the theme’s statement, he shows an improvisational vein with the support of the percussionist’s shimmering brushwork. The unhurried pace is then set without losing a bit of coordination. There is a strong spell of Mingus’ “Goodbye Pork Pie Hat” in the tune’s spacious atmosphere and melody. Great hooks occurring with incredible ease, groove-centric ideas that can absolutely swing, and an unshakeable sense of unity are all good motives for you to dig Hard Knocks.